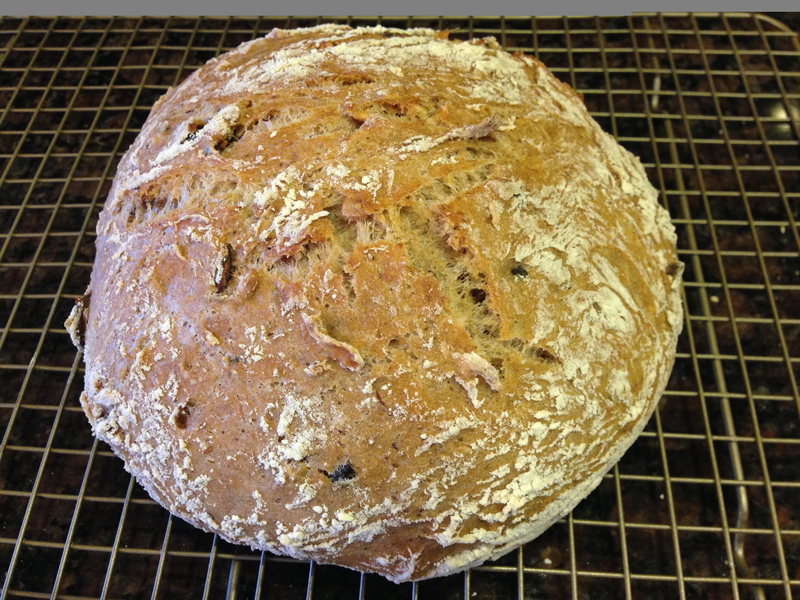 Most of us don’t have to light our ovens anymore but we certainly can put them to good use so why not make a delicious loaf of bread with whole grains and seeds? Making homemade bread (sans a bread machine) can be an intimidating and daunting, messy task especially for inexperienced bakers. 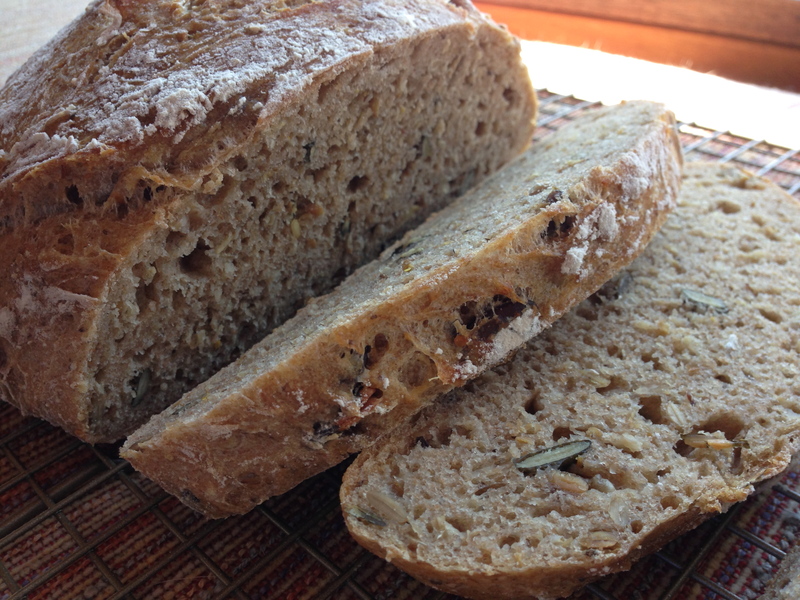 It’s one thing to spend precious time and energy to make a homemade loaf and quite another to have the bread turn out flavorful and delicious. But, what if you could make a scrumptious loaf of bread by simply combining a few ingredients, waiting for the dough to develop, and then baking it? 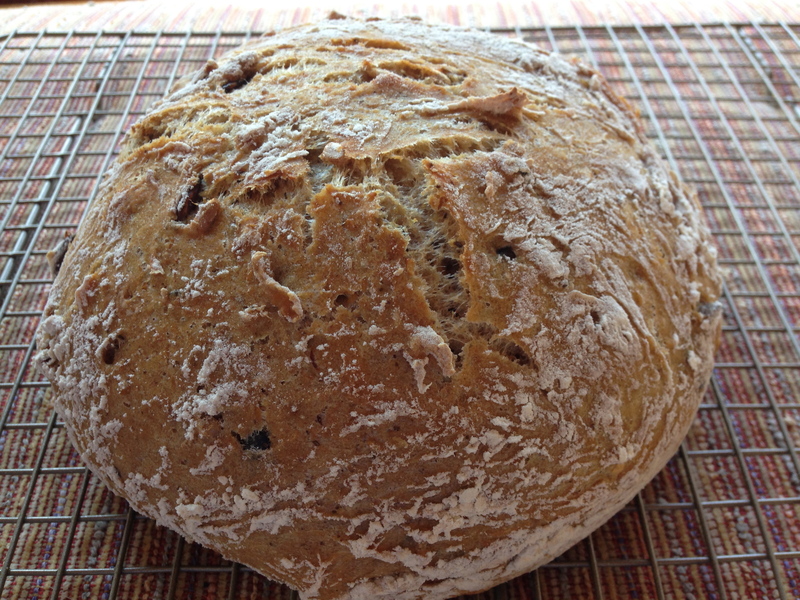 My friend, Matisse recently came to visit and taught me how to make a delicious no-knead whole grain and seed bread from a variation of a recipe by Jim Lahey, a breadmaster in New York City. The only kind of bread that I knew of that didn’t require kneading was banana bread so I was perplexed and a bit skeptical until she explained that the only thing a bread maker needs (besides ingredients, pans, and an oven) is time; time for the gluten to develop…as in 12 hours. As long as this bread didn’t require my attention for 12 hours, I was in. What follows is Matisse’s recipe (with a minor adjustment of a bit more salt because salt strengthens the gluten structure by holding on to carbon dioxide during the fermentation process (basically adds volume) and enhances the flavor, and a bit less water) for a moist, cranny-filled round loaf of No-Knead Whole Grain and Seed Bread that is so impressive both in looks, flavor, and texture that your friends and family will wonder why you’ve been keeping this talent a secret for so long, especially when they learn there is no added oil or sugar in this wondrous loaf. 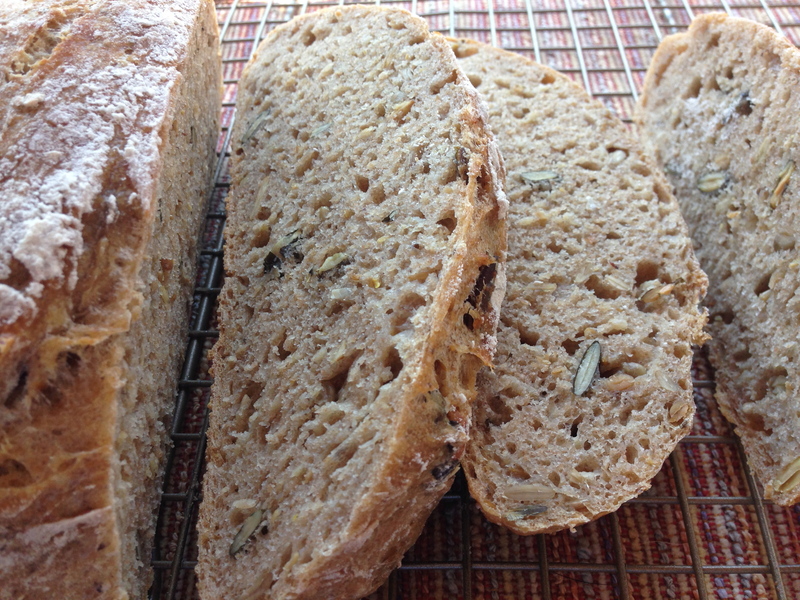 Place the flours in a large bowl along with the yeast, meals, seeds, salt, and oats. Stir to blend. Drizzle the water over the mixture and blend until a large, very thick dough evolves (about 1 minute). Cover with plastic wrap and then a dish towel and allow to sit undisturbed in a warm (70 degrees) room for 12 hours. Preheat the oven to 450 degrees. Place two 8-inch round cake pans in the oven (or any deep pan that has a lid) and allow the pans to heat up for 30 minutes. Carefully remove the pans from the oven and spray lightly with a non-stick spray. Remove the towel and plastic wrap from bowl with the dough. Using a spatula, scrap the dough sprinkling a few tablespoons of bread flour to lightly cover the dough. Pour the dough into one of the 8-inch cake pans (but don’t spread it out) and place the pan in the center of the oven. Cover the pan with the interior side of other pan (or the lid if you are using a pan with a lid). Bake for 30 minutes. Remove the lid and bake for another 5-10 minutes (depending on how dark you prefer the crust of the bread). Remove from the oven and allow to cool for 5 minutes. Transfer the loaf to a cooling rack and allow the bread to cool before slicing.